Technology Association of Georgia (TAG) President/CEO, Tino Mantella discusses the association’s State of the Industry Report. 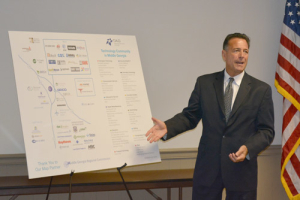 On Wednesday, July 22, 2015 the Middle Georgia Regional Commission hosted the Technology Association of Georgia (TAG) and its President and CEO, Tino Mantella, who presented the association’s State of the Industry Report. His presentation included a discussion on where Georgia leads in the technology sector, such as Health IT and financial transaction processing, as well as where there are opportunities to improve. Mr. Mantella stated that there is a great need in Georgia for employees with high-tech skills, such as computer programming and coding, but, unfortunately, the local supply of skilled labor falls well short of the demand and many of these jobs are being outsourced. He also stated that the economic impact of the technology industry to the State of Georgia is $113.1 Billion. More information on the State of the Industry report can be viewed online at: http://tagstateoftheindustry.com/2015/. TAG’s presentation in Middle Georgia was well attended with over 30 elected officials, local government staff members, and private business people. Those in attendance discussed the rapidly changing technology sector and expressed support for TAG’s initiatives to better position the State of Georgia to meet the digital economy of the future. Warner Robins Mayor, Randy Toms, spoke to the importance of open communication between tech sector leaders and local government leaders, so that local elected officials can understand what local governments can do to foster an environment that supports the growing tech sector, which in turn supports the community with jobs and investment. “Help us, help you, help us,” he said. The Technology Association of Georgia (TAG) is a leading industry Association dedicated to the promotion and the economic advancement of the state’s technology industry. TAG provides leadership in driving initiatives in the areas of policy, capital, education and giving, and also brings the technology community together through events, initiative programs and networking opportunities. TAG’s mission is to educate, promote, influence and unite Georgia’s technology community to foster an innovative and connected marketplace that stimulates Georgia’s tech-based economy. To learn more about TAG or to become a member, visit their website at http://www.tagonline.org/.